From the Desert Hope Collection. This barrel saddle features floral tooling accented with white hair-on, silver and turquoise dots and silver and turquoise crosses. Roughout fenders and turquoise suede seat complete the look. Tough-1 quick change buckles. Saddle packages includes cord girth. Super comfortable seat, super light and easy to carry. Again only complaint is the beats get loose really easy and have lost 3 already and have had it for a month and a half. But the seat is super comfy and doesn't force you to lean forward like some barrel saddles. Turquoise dots were falling off taking saddle out of shipping box. Decent for the price, get what you pay for. Very pretty and will work okay. But, dots and some features not real durable. I was very surprised with the beauty of the crosses on this saddle . I wasn't impressed with the workmanship . There are gaps on both side of the skirt where it meets under the cantle and several long scratches on one of the stirrup fenders. But for the price which is the cheapest ... I saw it on an other sites for $1499. This package is complete in every way I didn't expect for it to include the front girth.I bought this saddle for my birthday and it arrived on my birthday. can you get this in pink? BEST ANSWER: I'm sorry, the manufacturer currently makes this saddle in turquoise only. Can I buy the matching flank strap as shown in the picture but not included?? The flank strap is included with this saddle. If you received this saddle without a flank strap please contact customer service so the flank strap can be sent to you. What is the tree width at gullet? Is this an all around saddle or...? BEST ANSWER: We use it for barrels, poles, speed, and pleasure riding. 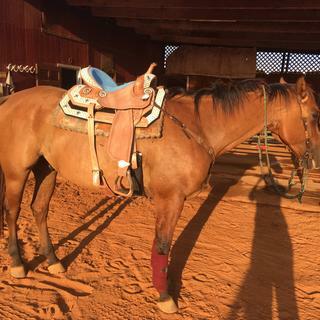 It is "dressy", looks really nice and has served us well as an all around saddle. is this saddle more of a sky blue or a turquoise? BEST ANSWER: I would say turquoise, matches accent stones very well. WOULD IT FIT A 9 YR OLD GIRL THAT IS 4.0? BEST ANSWER: Because saddle seat size is based on leg length, rear end size and rider comfort than overall height, it is best to consult with a local person who has experience fitting saddles to determine the best seat size for your 9 year old girl. Is this saddle like other barrel saddle? Like I am a 17in in a barrel saddle i usually go ahead and get a 16in. Is this saddle like that? BEST ANSWER: This saddle is true to size so a 16" saddle measures 16". BEST ANSWER: Unfortunately we do not have conchos available for sale separately. can i return the saddle if it doesn't fit my horse? Can you buy the saddle seperate, or does our only come in the package? BEST ANSWER: We currently offer this saddle in the package only. Does this saddle come with a front cinch? BEST ANSWER: It does not include a front cinch. was this saddle on sale? BEST ANSWER: This saddle is currently on sale. Will this saddle fit a person who is 4'9? Is it made of real leather? are the breast strap different sizes? BEST ANSWER: Additional package items will be average horse size: 800-1,100 lbs. What is the tree made out of? BEST ANSWER: Hello, please see the link below to help determine the correct saddle size.